The World Cup is upon us once again, 32 countries, 64 matches, and only one winner. To make things more interesting, this year we are asking you to get involved. Instead of looking at how the participating countries perform on the field. We would like you to look at how these countries perform as incentive destinations, voting for the countries that would motivate you most within the workplace as part of a reward and recognition programme. Request your very own pack of 'Penguins Top Trip' cards today, for free, whilst stocks last! 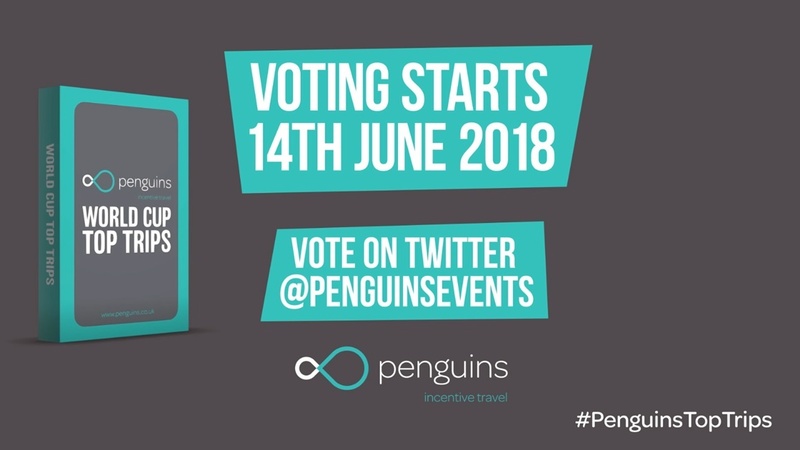 Voting will commence on Thursday 14th June and run through to Monday 16th July. First, the group stages will take place, resulting in the two countries from each group with the most votes making it through to the next round. Once we have our top 16 countries we will see these fantastic destinations pitched head to head, eventually leaving us one triumphant destination. Be sure to get behind the countries that you love and share moments from your incentive trips. Want to share the fun? We liked the idea of this so much, we thought it would be great to create a card game "Penguins Top Trips". This game is perfect for a little bit of fun with colleagues, family and friend and have chosen some really insightful categories that will give you useful information to help you make those important voting decisions. We have a very limited number of packs of cards that we can send out, so you’ll need to move fast. Click here to request your pack. Or alternatively, if you haven’t managed to get your hands on a pack of cards, you can always download the template and print off to play at home.